How on earth are you going to feel at home in a little cinder-block room in a building you share with a bunch of strangers? Somehow, you will, and you will probably grow to love dorm life! A half of a 13ft by 13ft colorless room is not likely to become a coveted chuck of real estate anytime soon, but the community of a residence hall is something you cannot find anywhere else. What should you expect when you move into your residence hall? How can you make the best of it and enjoy your little corner of home? Learn as much as you can about your room (its dimensions, colors, position in the building, etc…) and residence regulations before you move in. Over-packing and then sending home half of the things you wanted to make your room cozy or discovering that your mini-fridge isn’t quite mini enough after moving it up three flights of stairs will not ease your transition at all. Know what you will have space for and what you can do without. Where can you find this information? Your college’s residence services website! Look for a list of FAQs and a copy of the housing agreement. What questions should you try to answer? What is the size of the room? What furniture is provided in the room? Is it air conditioned? Can you bring an air conditioner if it is not? If you are buying curtains, what size are the windows? Is there a built in closet or standing wardrobe? Is sink or bathroom in the room? My hall has cockroaches, quite a few of them, honestly. I had never seen a cockroach until I moved in, so that was a bit of a shock. There is a fair chance that your residence hall will not be as tidy as your home is, because there are lots of people sharing the space, and maybe some pesky insect guests. Make the best of the situation: keep things as clean as you can to minimize grotesqueness, and when you find yourself holding back a squeal when a cockroach parades in under your door while your roommate is still asleep, deal with it, then laugh it off. Take care of yourself and take precautions to keep yourself healthy. Residence halls are a virus friendly environment because all of the residents live in close proximity and share facilities. You are not officially a college student until you beat the Freshman Plague, yes, you will get it. Nevertheless, you can do a lot of things to avoid germs. Avoid setting personal items, like toothbrushes, directly on shared counter-tops. Disinfect your desktop, electronics, doorknobs, and student ID card regularly. Even if people leave sponges and dishtowels in the kitchen for anyone to use, use your own! My roommate is amazing, my hallmates are absolutely fabulous, and all of us get along well together. We have differing habits and sleep schedules, but we each understand that the others need the same liberties and privacy as ourselves. Always consider how your actions will affect others, and always be willing to compromise. However, if something your roommate or neighbor does is a true botheration to you, don’t hesitate to talk about it as diplomatically as possible. 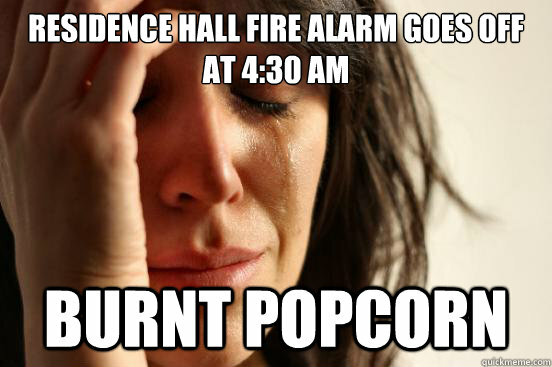 Also, popcorn—it sets off fire alarms more often than anything else. Do not leave your popcorn alone, it cannot cry like an abandoned child, but the fire alarm will wail like a banshee on its behalf. Your hall will most likely have its own hall agreement, which lays guidelines for the uses of shared spaces. As a community member, you should abide by those rules to help maintain a positive atmosphere in your hall, because no one wants to live in a building full of grumps. The source of most issues in shared spaces is when residents live a mess behind. Clean up after yourself, in the bathroom, laundry room, or kitchen. Then no one else will have to do it for you, and everyone will be happier! When in Doubt, Go to Your Residence Assistant! I love my RA! She is the sweetest. If you ever have trouble with your roommate, would like to change something in the hall or community that is making you uncomfortable, or just need someone to talk to, go to your RA. They are trained to deal with all of those things and more. Board Games!! : Bring board games with you and invite your hallmates to play in the lounge on a Thursday or Friday night. Share a Meal: Join your neighbors for breakfast, lunch, dinner, coffee, or a snack. Enjoy a chat and commiserate over cafeteria food. Go Places: Some of my hallmates and I go to free classic music performances around campus whenever we can. You can go to campus events, go shopping, or just go for a walk. Cook: Nothing wins hearts like food. Craft: I have some very crafty hallmates who like to keep our hallways looking spiffy with door decorations and posters they make together. It brings a lot of cheer to plain walls. Elaine on So long Scotland, see you in 2017! Hello! I'm Colleen, the Unconventional Collegiate. 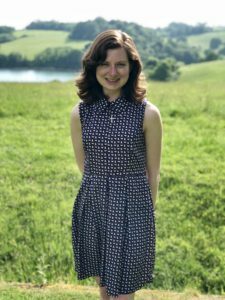 I am a student who loves dusty old books, scrumptious food, music, academia, and life in general. Enjoy my blog!